The first two videos are uploaded by CentripetalWorlds. 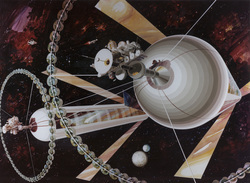 Both feature O’Neill cylinders, video one appears to show, the construction of an O’Neill cylinder. Two rotating O’Neill cylinders (warning: annoying sound, please mute volume). The Kalpana One is an interesting design, and quite suitable for the first generation of space settlements (O’Neill cylinders have been considered as a second generation space habitat since they were designed). For a technical discussion of O’Neill cylinders, by no one less than O’Neill himself, see here. Previous PostPositive discriminationNext PostBernal Spheres, Stanford tori and the return of the polis.